Many believe the best cloud watching time is in the late afternoon in summer… A nice glass of cold ice tea is the perfect addition to such a cloud watching time. Looking at clouds, whether formed by tea leaves or water and ice, has been a pastime of many people. The Ancient Celts used clouds to tell the past, present, and the future. They practiced nephomancy, which uses the cloud’s shape, color, type, and position to tell what has happened, what is happening, and what will happen next. But what are clouds really? Clouds are formed by water vapor sticking to miniature pieces of dust. As air cools, water droplets stick to the water vapor coated dust. The more dust, water vapor, and water droplets in the air mean you will now see a cloud. Much of the Earth’s water vapor comes from the oceans, which may be why in Greek mythology, clouds were the daughter of Ocean (Okeanos, Oceanus). In many ancient cultures such as, China, Greece, Persia, and India, clouds were seen as celestial vehicles that allowed men to ascend to the heavens or gods to descend to Earth. Many paintings from these ancient times show men and gods riding on the clouds. What does it mean when you find clouds in your tea leaves? If clouds have shown up in your tea leaves, it’s a cautionary sign. It tells you that something you want isn’t quite visible or isn’t ready to be given to you. What you might want should soon come to you so don’t worry too much about it. If you have a problem you are trying to fix, you may have to wait a bit longer to fix it. If you spend time with your “head in the clouds,” the clouds symbol showing up in your tea leaves is telling you to come back to the earth and face the issue you have been avoiding. If the clouds symbol in your tea leaves also has dots around it, more than one problem is coming your way. 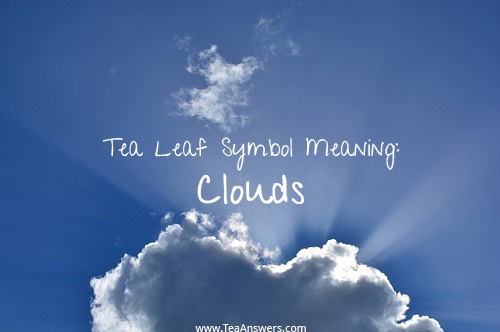 The clouds tea leaf symbol also negatively affects other symbols around it. For example, if the clouds are near a heart, ring or circle, they can indicate emotional/relationship difficulties.